We install only “muck” grown for our St. Augustine sods. Prior to all installations we flag all sprinkler heads and test irrigation coverage. A few days before the installation, we contact your local utilities and if applicable, they flag their cables and wires located in the work area. OB Garden Center Inc. is given a ticket number with all requests. This ticket number is available at your request. Utilities include gas, cable, phone, internet, etc. We are fully licensed, insured, and bonded. Copies available upon request. Once your installation is complete, your appointed sales representative will contact you to go over watering instructions and any other questions you might have. Thank you for the opportunity to serve your lawn and garden needs. 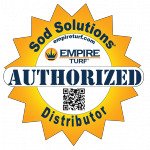 Get your sod installation estimate today!